Back/Sides: East Indian Rosewood, Cocobolo, Honduran rosewood, Madagascar Rosewood, Brazilian Rosewood(+2,000). Tuners:Gotoh Lyre style or Fustero upgrade. I am now building a new lattice braced instrument. This instrument features an arched brace-less back which facilitates greater volume and projection. A unique feature of the lattice design is the benefit of gradation of dynamics and tone color which gives the player a broader musical palette. The top is braced with a 9 x 9 strut lattice of carbon fiber and balsa wood which will not distort or weaken over time. Top thickness is 1.5mm which is thicker than the guitars of Greg Smallman which are 1.2mm in the middle to 0.7 at the edges. 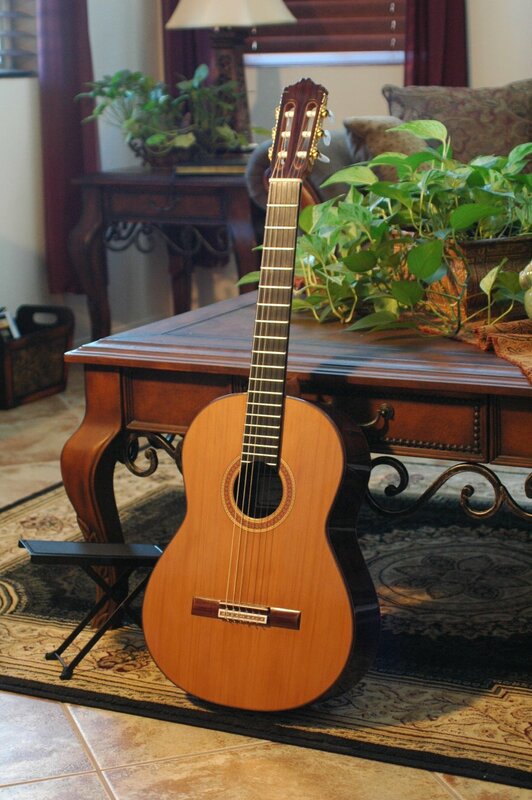 This style of guitar is less prone to damage from adverse humidity conditions. The neck can be built with an adjustable neck for quick on the fly action changes. This requires a 1/8" allen wrench. Soundboard:Western Red Cedar with balsa/carbon fiber lattice bracing and hardwood armrest. Brace-less arched Back/Sides: East Indian Rosewood, Cocobolo, Kingwood, Brazilian Rosewood. Neck: Mahogany or New Guinea Rosewood when available. Soundboards: Cedar, Redwood, & Spruce. Back/Sides: East Indian Rosewood, Cocobolo, Bubinga, Cypress, & Maple. 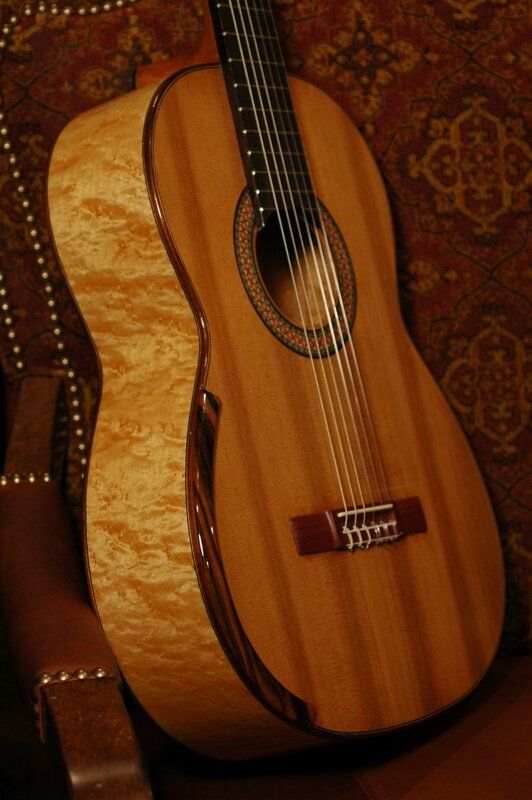 Neck: Spanish Cedar or Honduras Mahogany. Tuners: Gilbert, Gotoh, Rodgers, Schaller, and Sloane. Basic Scale Lengths: 640mm, 650mm, 655mm, & 660mm. Back/Sides: East Indian Rosewood (Negra) & Cypress or Maple (Blanca). Tuners: Machines or Hand-Crafted Schramm Cocobolo Pegs. I only offer French polish shellac finish, Varnish, and water-base finishes due to health and environmental restrictions. The scale length of 650 is standard. All other scale lengths are available and are considered custom orders. Scale length also influences sonority and feel of the instrument. Some options are Covered "Vee" head joint, Gilbert style saddle pin bridge, Trapezoid head slots, 12-hole bridge tie block, custom rosette made by the luthier,etc.E-mail me with your special needs. There are many cases on the market today that will meet your needs and budget. Therefore cases are provided at my cost in addition to the price of your instrument. To place an order require a 50% non-refundable deposit when construction begins. The remaining balance of 50% is due when the instrument is complete and prior to shipping. In addition to the cost of your instrument are shipping, applicable sales tax, and a case. I do on occasion make custom guitars if I am inspired by the project. You can expect to pay more for custom models since I have to redesign my process and tooling for some of these projects. If you are uncertain about purchasing , please do not place an order at this time. All sales are final! All guitars are coverd by a limited warranty to the original purchaser for life against defective materials or workmanship. I will not cover damage incurred by misuse, accidents, normal wear or natural cracking of wood or finishes due to changes in age, temperature, and humidity. Wood by it's nature can not be guaranteed! Purchaser is responsible for all shipping and postal charges of the repaired instrument. Contact me for the current wait period. Referrals are provided upon request.